Heat 1 T. olive oil in a dutch oven at med-high heat. Add chopped prosciutto and cook, stirring to break up the clumpy pieces, until crisped, 5-7 minutes. Remove with a slotted spoon to a paper towel-lined plate and set aside. To the fat in the pan, add the garlic head, cut-side down, onion, carrot and red pepper flakes. Cook, stirring occasionally until onion is softened, about 5-8 minutes. Add the rosemary, cheese rind, broth and beans. Bring to a simmer, reduce heat to medium-low and simmer until the garlic is soft, about 30 minutes, removing the rosemary sprig halfway through cooking. Meanwhile, heat the oven to 400 degrees. In a small bowl combine 3 T. olive oil, chopped rosemary and minced garlic. Spread the bread slices out on a baking sheet and bake for 5 minutes, remove from the oven, flip the slices and brush with the rosemary & garlic oil. Continue baking until the toasts are crisp, 5-10 minutes longer. Set aside while the soup finishes. When the head of garlic is tender, remove it from the soup along with the cheese rind. When cool enough to handle, squeeze out the cloves and mince fine. Add back to the soup, make sure the soup is at a gentle simmer, add in the spinach and cook until just wilted, just a minute or two. Adjust the seasoning with salt & pepper. 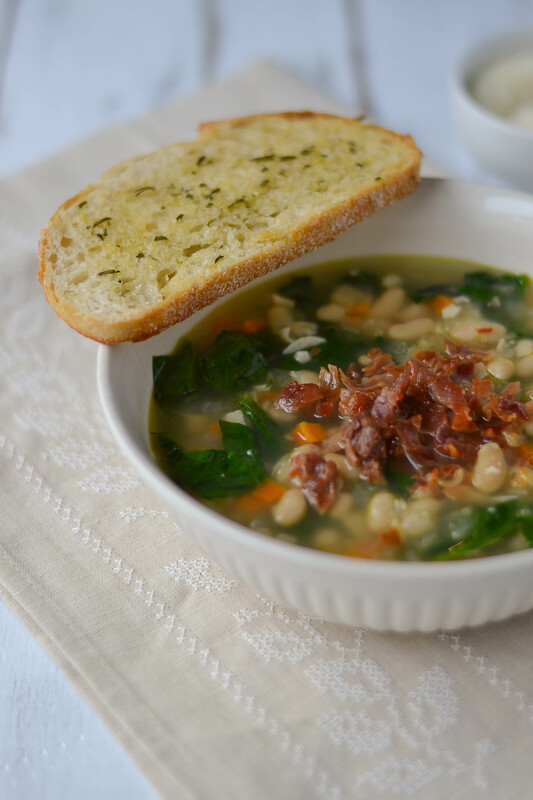 Serve the soup topped with the crisp prosciutto bits and the rosemary-garlic toasts. 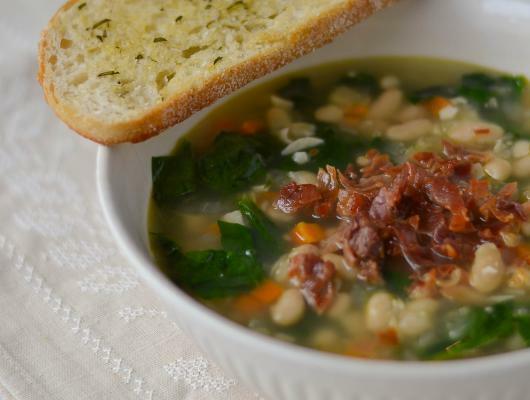 A quick and delicious white bean and garlic soup with spinach, and topped with crispy-fried prosciutto bits. Served with garlic crostini.